’Tis the season—for parties! And that means it’s time to think recipes, especially fun Christmas treat ideas that give people something to talk about. 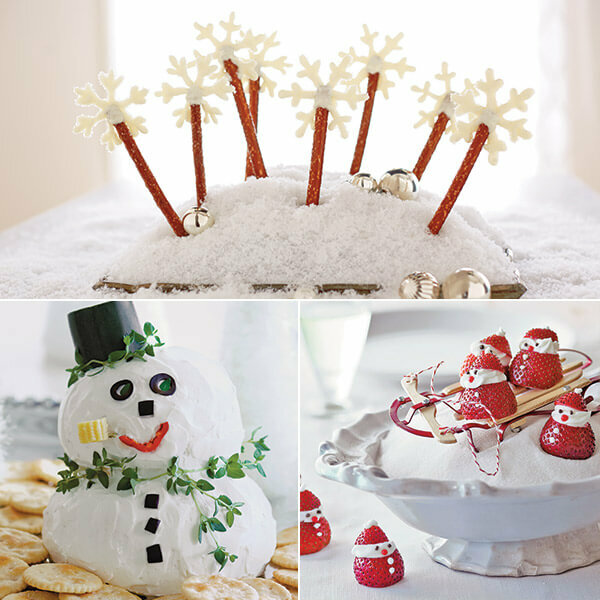 This year, our festive feast of fun food includes seven easy Christmas treats, both savory and sweet: Christmas meringue cookies, snowflake wands, strawberry Santas, mini sausage wreaths, snow-nuts, a snowman cheese ball and playful penguin ice cream pops. Merry Christmas! Standing alone or in an edible forest, these festive Christmas trees add color to any table. An elegant and delicious upgrade on a classic kid-favorite. It’s not the temperature that will make this snowman disappear. It’s hard to take just one bite of this cheese ball. Don’t be surprised when this treat waddles its way onto your family’s holiday favorites list. These little Santas are almost too cute to eat. But go ahead—you can always make more! Make Christmas magic appear with these easy treats made from almond bark and pretzels. These delightful donuts are perfect for those who would rather assemble than bake—and they are just as yummy!